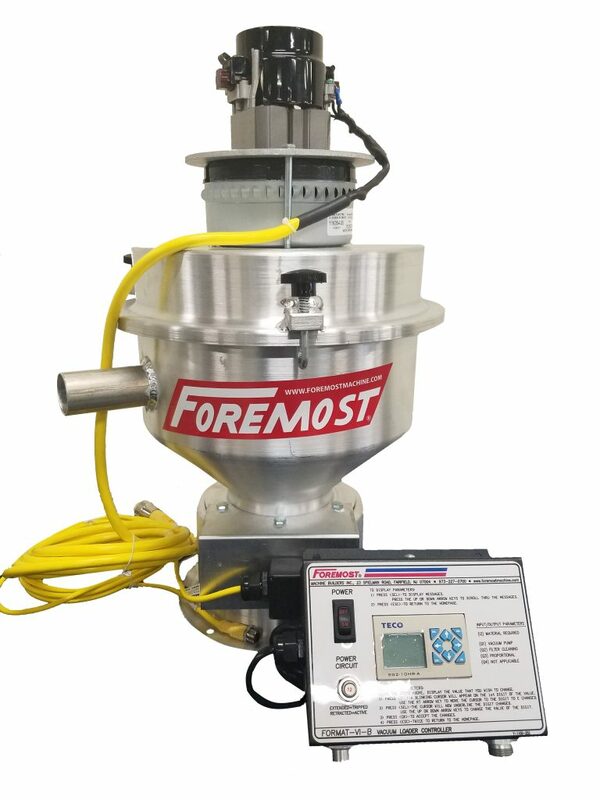 Self-Contained Vacuum Loaders – B Series – Foremost Machine Builders, Inc.
Foremost manufactures self-contained vacuum loaders for the transportation of raw material pellets and reclaim material from a storage silo to a blender, from one process station to another, and/or to the final processing point. The Self-Contained Vacuum Loaders B-6-2 and B-8A-6C are perfect for moderate hopper or bin loading tasks. Both units offer fractional horsepower brush type motors. The units feature a nylon filter and compressed air for easy filter cleaning. Operation requirements are 110V single phase AC and a convenient remote mountable control panel. All units supplied are completely wired for 110 volt, single phase, automatic operation. Compressed air Filter Cleaning (Model B-6-2C) …Patented, I.F.T.-type, Two Material Proportioning (Models BP-6-2 and BP-8A-6C). 1 10 ft. lead cable with plug. A PLC controller with keypad and display.